Check Out What’s Happening in Your Community this Month! Look ahead and plan your next family outing, arts and cultural performance, educational seminar and so much more! All of these events are happening right here in YOUR community and are hosted by Jacobs Center for Neighborhood Innovation Community Partners. We look forward to seeing you at an event this month! With this series of workshops, girls will develop an understanding of #NoMeansNo using their own thoughts and perspectives to create ART that speaks THEIR voice! Workshops will take place at the Joe and Vi Jacobs Center in the FANCY office every Thursday March 1st – April 5th from 6 PM – 7 PM. Final art pieces will be displayed at the FANCY Teen Girls Expo in April and the Black Student Union at UCSD in May! THIS SATRUDAY at the Market Creek Amphitheater!!! 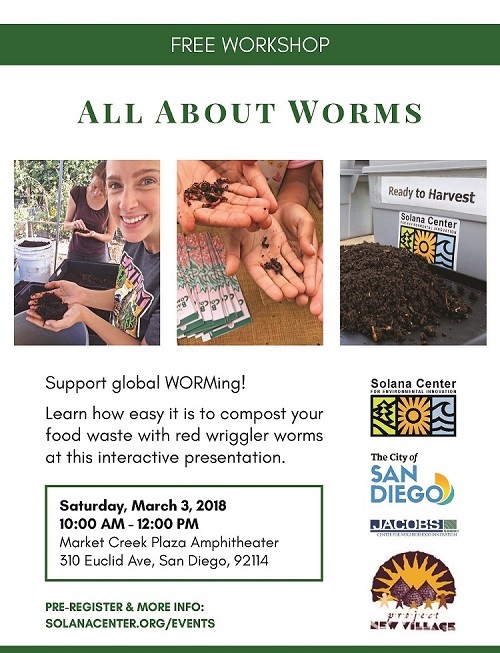 Learn the ins and outs of composting and how easy it can be! Mainly Mozart presents their first 2018 Spotlight Chamber Music concert, featuring acclaimed cellist Lynn Harrell and the award-winning Henschel Quartett. The program includes works by Mozart and Schubert. To acquire your tickets, please visit MainlyMozart.org or call (619)239-0100. Celebrate with the community, family and friends of Kitchen’s for Good’s Class 10 graduating class! Learn about how their program is changing lives and helping students build skills in culinary arts that lead to stable employment. Lunch will be provided by graduating students. You don’t want to miss out! 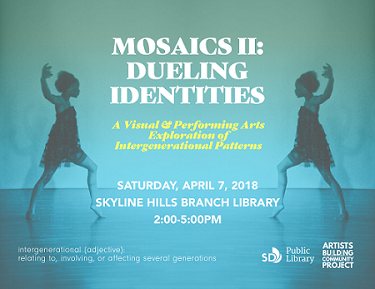 Join “Mosaics II: Dueling Identities” on Saturday April 7th @ 2pm to discover your connection to code switching through visual & performing arts! Visit their event page to learn more about intergenerational patterns, how to reserve your spot, and even how to participate as an artist during the event! 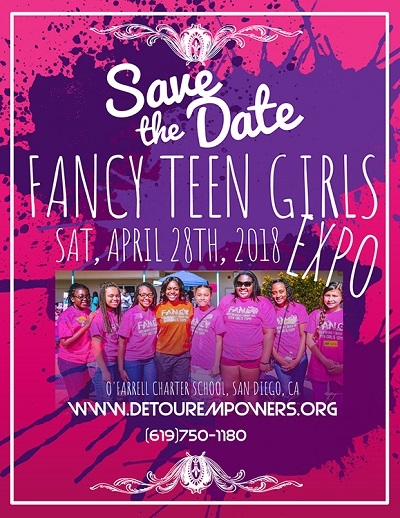 This free event will host 200 teenage girls between the ages of 11 – 19 as local professional women and community advocates provide empowerment through seminars, panel discussions, and entertainment. Girls will have the opportunity to engage in discussion, interact with others to share their stories, and connect with community mentors and service providers. Community & STEAM Resource Fair included! We are searching for Volunteers, Sponsors, & Community Vendors! Join us as we celebrate the winners of the 2018 Mainly Mozart Youth Orchestra Solo Competition! This recital will feature wind and string players from all six of our youth orchestra ensembles. To reserve your free tickets, please call (619)239-0100 ext. 303, or email achoi@mainlymozart.org. Mainly Mozart’s second Spotlight Chamber Music concert of the year features Anton Nel (piano), Steven Copes (violin), Hsin-Yun Huang (viola), and Ron Thomas (cello). The program includes works by Beethoven and Dvorak.